As I child, I was forced to spend what seemed like days at a time listening to my grandfather tell tales. His Model T travels. His look-the-other-way Prohibition-era renting of the barn. And just about any other yarn he cared to repeatedly share. My grandmother would quietly sit nearby, her hands folded neatly in her lap, as proper and attentive as the African violets sitting next to her on the end tables. I, meanwhile, would squirm, trying desperately not to slide off the plastic-covered sofa into a puddle of boredom, all the while staring at those darn little potted flowers, which I resented for sitting there so serenely while I was so miserable. Some years later, my floral prejudices resurfaced when edible petals ran rampant at gourmet grocers. You know the ones—button-like blossoms that sat this time in flimsy plastic containers looking as prim and smug as African violets. They drew nothing but disdain from me. Ridiculously expensive, frilly little flourishes, I thought. I happily clung to my contempt for years. And then one day, it was gone. It was a Saturday, late morning, overcast. My reprieve? It came in the guise of a bin at the greenmarket filled with delicate summer salad greens—mizuna, and tat soi, and mint, oh my—pixelated by brilliant oranges and yellows and a stray streak of red. Splotches of color took the form of delicate, trumpet-shaped blooms. 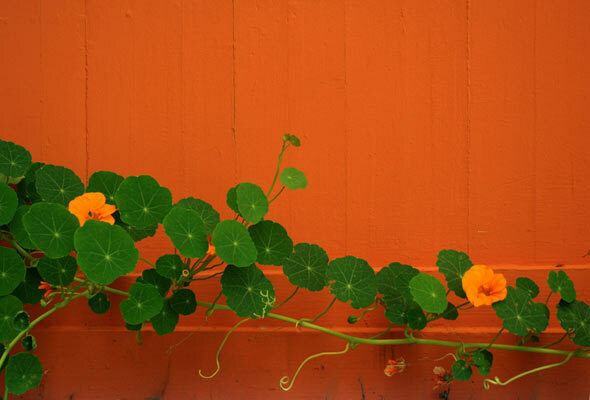 Nasturtiums. Even the name held promise. I gawked for longer than I’d care to admit. Then I scooped up some greens, ditched the rest of my errands, and made my way home straightaway with my stash. Showy yet not ostentatious, the flowers were worthwhile not for their novelty, but their taste. They were slightly sweet, strangely peppery, and had an unforgettable finish. They just sort of taste happy. I’ve been bewitched ever since. This time of year, at any given moment, chances are darn good that there’ll be at least a box or two of blossoms tucked away in the special place in the fridge (the second shelf, all the way to the right, beneath the spring scallions). And I’m prone to get a little uneasy when there’s less than half a box left and still a day or two to go before my next fix. They are, in a word, culinary crack. I’m not the only nasturtium inamorata to have stopped in her tracks and stared. “A lot of people stop and ask what they taste like,” says Tim Wersan, manager of Windfall Farms, purveyor of unconventional produce at Union Square Greenmarket. His solution, rather than attempting to explain the characteristic yet indefinable flavor, is to coax customers to try them. (“Just use the tongs, please.”) Many marketgoers cautiously nibble a single paper-thin petal. Wersati quickly disabuses them of this notion. “You’re not tasting it,” he reprimands gently. “You have to try the entire blossom so you can taste the nectar.” Indeed. Lest anyone be wooed just by the blooms, the slender, bendy stems and silken leaves are also edible. In the same way that some people, myself included, like to gnaw steak bones, some of us also nibble nasturtium stems—all the way up to the blossom, where they taste particularly sweet. Nasturtium leaf pesto, pickled nasturtium buds, and other novelties exist. Yet those incarnations seem overwrought when simpler pleasures abound. City Bakery relies on the flowers for its slightly peppery flower lemonade. A food editor I know at Martha Stewart Living stirs them into goat cheese, magnificent swirls of orange waiting to be spread on crostini. I sometimes steep the blooms in vodka, infusing it with sharply sweet vibes. But mostly, I just strew the blossoms and their leaves atop eggs, stir them into sticky rice with a scattering of cilantro, or take the blossoms plain, anointed with a drop or two of extra-virgin olive oil. One night not so long ago as I sprinkled nasturtiums over mache, my darling E. came up close and said out of nowhere, “No wonder you stay so pretty. Look at the pretty things you eat!” You can see why I married him—and why I like to keep the nasturtiums around. Maybe that’s just a bunch of hooey. Then again, perhaps not. After all, it brought about quite an attitude adjustment in me. Whether it’s the actual vitality of the flowers or simply the happy sight of them that brought about this exuberant effect, does it matter? That’s flower power for you. *Note: This statement has not been evaluated by the FDA. This product is not intended to diagnose, treat, cure, or prevent any disease—which is not to say it can’t do so. Where to Find Nasturtiums in New York City: Boxed blooms tend to sell out long before noon this time of year at New York City’s Union Square Greenmarket, whether at Windfall Farms (Wednesdays and Saturdays), Two Guys From Woodbridge (Wednesdays and Fridays), and, on happy occasion, at Nevia No’s Bodhitree Farm (Wednesdays and Fridays). The blooms are also tossed among the mixed greens at these stands, where an unspoken honor code (mostly) prevents customers from piggily snitching an unfair share of pretties. Perhaps the most cost-effective measure is to simply buy an entire plant. But that requires far more restraint than I can muster to not strip the stems bare in one sitting. Photo © 2005 SeenyaRita. All rights reserved.